This is my journal when at first time I cook for chicken and mushrooms curry without instant spices. About to more than 5 years ago I think, but it still written on my journal so I bring it here so you can take a tips. I take care the process by myself from beginning to ready being eaten. I usually just bought instant spices and seasoning then I just mix all the ingredients. And I realized one thing after I take care of raw chicken by washing and cleaning managed to make me feel bad. I cant tell that it is bad for my appetite, but since I had already purchased the chicken so I think I should eat that. Organic chicken not that cheap for purchase, and yeah it is an organic chicken so it won't hurt. Usually when we are cooking chicken curry together, my sister is the one who cleans the chicken so that is ready to put in the stew seasoning. I think I don't want to cook raw chicken again with my own care process from the beginning, uh ... * horror active mode. At home we usually make this food with raw coconut milk but we maintain to produce coconut milk consistency are a little thin, not too thick. So this is the first time I use instant coconut milk for cooking and I was surprised that the levels of consistency it seems beyond my expectations. This is thicker consistency coconut milk I ever met. Moreover I can't find any ginger, lime leaves (which is said to relieve nausea in dishes with coconut milk) and lemongrass in a stall, all of them drying extremely, because shop owners have no refrigerator to store it. But unfortunately I really need them because I made mistake when putting all coconut milk I have, I need to put them for taste correction. With the thick consistency of coconut milk, my chicken curry made me nausea whenever I taste it. 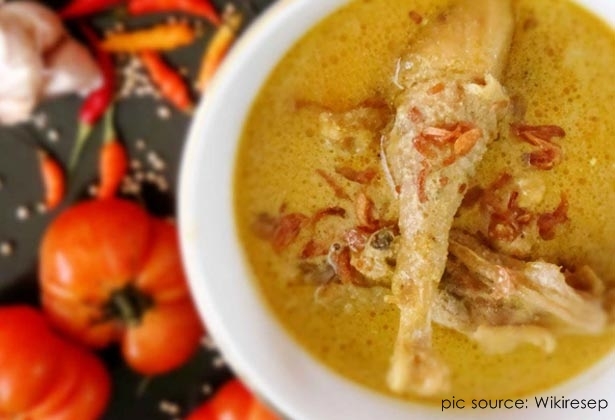 The taste of salty and spicy flavor on that chicken curry somehow could not be mixed well with a savory taste of the thick coconut milk. So I try to squeezed lime and stir to blend the lemon extract with chicken curry. It fillany mixed, I stir it again and take some for taste... I smile happily because the nausea feel from coconut flavor was a little faded. I mix it again and squeezed a little more lemon juice and curry flavor dense thick coconut milk that makes it more thinning the nausea feel again. So it feels lighter, and I found out a balance mixing between spices and coconut milk. Eventually this could be eaten and I know how to solve this problem, hehe ... * tacky me when I wrote that just might not know the solution well like this? There is still a lot to learn for me. Maybe that's why my aunt told me to buy no more food outside and cook my own meal in the boarding house, try things that I had never experienced. Before this, I has big dependent on food stalls. And of course to be able cooking some food, it's always takes a long process of trial and error ... if error error that was already perceived so it must sooner or later will never be a big problem anymore right? I just now actually realize that it is true, the most expensive good teacher is a teacher named experience.